So it’s been a year since Mikey has posted and more than two since I’ve been able to come up with anything good to write. First, I’d just like to say that, no, I wasn’t on hunger strike. I was working my way toward a law degree and all the fame and fortune that comes with it. Ironically, I am now in the exact same state as I was when Mikey and I started this site a little over three years ago. I am currently unemployed. Alas, a kid’s gotta eat. So here’s a little post about one of my latest dining adventures at the newest Thousand Oaks hotspot, Umami Burger. Okay, I’ll be the first to admit. I love me some burger goodness. After all, we’ve had some great ones here at EatMeCalifornia. The best among them, in my humble opinion, is the Father’s Office burger. We’ve also had great burgers at The Apple Pan and, of all places, PJ’s dive bar. With that said, I have to admit that I’ve been hearing the siren’s song that is Umami for quite a few years now, and this, this!, was my chance to dive right in. The newest Umami location can be found in The Lakes shopping center on T.O. boulevard. It’s a snazzy kind of place that has had some down luck after the economy took its turn for the worse. Consequently, the space that is now Umami was once the home of Nate & Al’s deli, and before that, some sushi place that apparently sucked enough to be on Kitchen Nightmares. I was really hoping that Umami would be the place to break the losing streak. I call them mega tots, and when they arrived at our table I figured I would be able to get over our server’s poor attitude. Imagine my surprise when I bit into the tot and realized that the crunchy outer shell was about as thick as the skin on an apple. Also, it was lukewarm. Also, also, it tasted like the potato had been blended with sour cream and whoever fried them had erroneously thought that salt had never been discovered. In an effort to cleanse the palate of what had to have been the worst excuse for a tot that I’ve ever had the displeasure of eating, my friend and I ordered some fries. Actually, we ordered a combination of the regular fries and sweet potato fries. So here’s the good news: these fries actually tasted as if they had been seasoned. 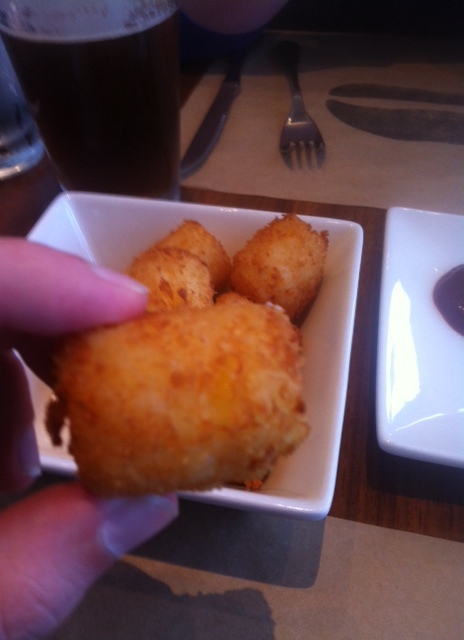 The regular ones were thin but crispy and after the tots, were a pleasant surprise. 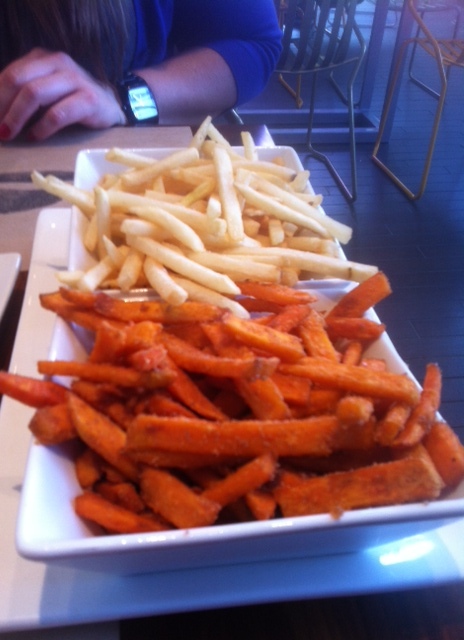 The sweet potato fries were even better. They were crisp on the outside, melt-in-your-mouth soft on the inside and were dusted with a generous helping of brown sugar. If not for how quickly they went cold, I would probably call them the best sweet potato fries in the history of the earth. So things were looking up, and we still had the main event to go. My friend ordered the original Umami burger and I ordered the Port & Stilton burger. In the interest of full disclosure, we both ordered them cooked medium (which was suggested by our favorite server). That, my friends is the Umami burger. 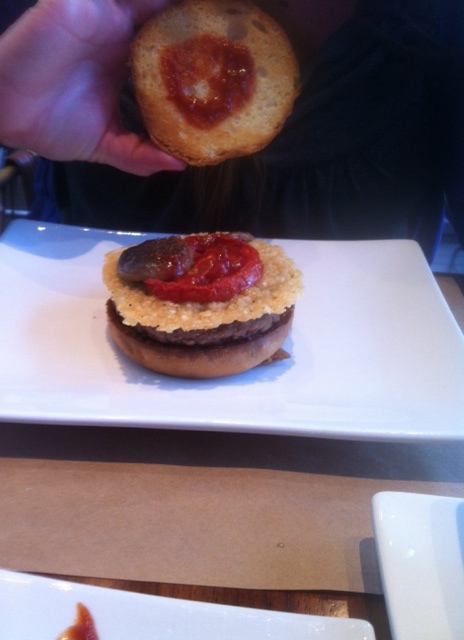 It supposedly comes with shiitake mushrooms, carmelized onions, roasted tomato and a parmesan crisp, all topped with umami ketchup. Oh yeah, it’s got a burger in there too. Still, as you can see from the picture, they were very cheap with the toppings. For example, there was one sad little shiitake mushroom on my friend’s burger. Where were all his little shiitake brothers and sisters? 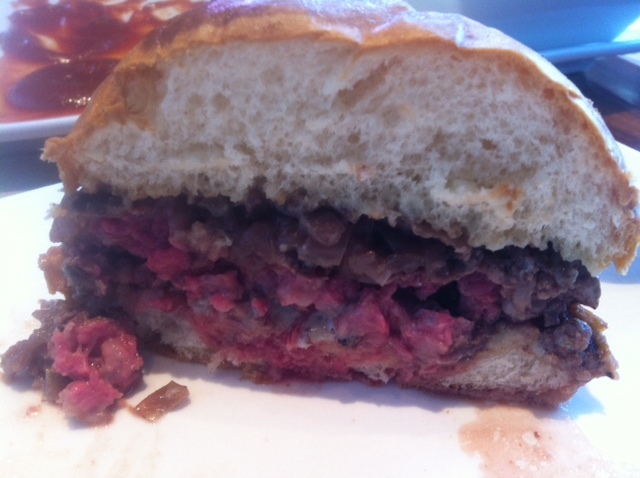 Next up was my Port and Stilton burger with onions carmelized in port (allegedly) and stilton blue cheese. Once again, they were not exactly heavy handed with the toppings and I was left feeling like the kid who got the PB&J right before the jar was empty. 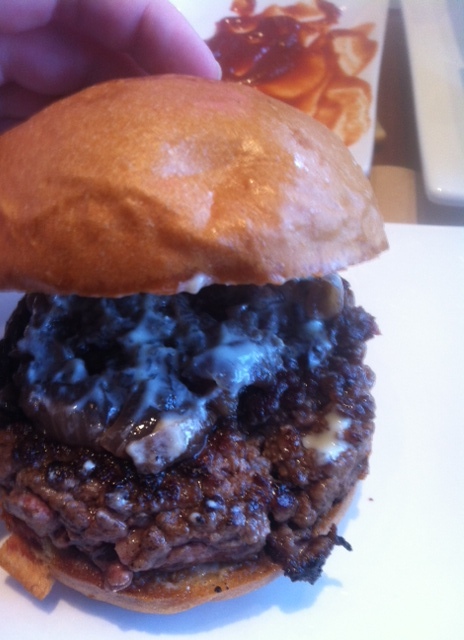 Still, I was optimistic about the supposedly other worldly flavor that Umami is said to conjure in their burgers. Then I cut into my burger. If that’s cooked medium, then I’m best-selling German recording artist, David Hasselhoff. Alas, I am not David Hasselhoff and that is ri-goddamn-diculous. Still, I thought I could eat around the middle and see if some of it was salvageable. For those of you who don’t know me, I never send food back. It’s partially because I don’t like to rock the boat and partially because I don’t like bodily fluids in my meals. If ever there was a time when I should have sent something back, it was this time (or maybe this time, with the hair). Instead, I ate some of what was probably the grossest burger I’ve ever consumed. Anyway, after the burger debacle, we grabbed the check and got the hell out of there as quickly as possible. Based on the experience, it’s hard not to think that Umami is highly overrated. This could just be an off night, or an off chef, but it says something about the food when you don’t finish any component of your meal. Even the sweet potato fries were left half-eaten. The prices are high for a burger place and the decor is more akin to patio furniture than a classy burger lounge. Service was attentive, although somewhat snobby and the overall experience was utterly forgettable. Next time I’ll head down to Father’s Office for a real burger, or just save my money and get In-N-Out. Stay tuned in the coming days for more posts from Mikey and I. We are back and are looking forward to plenty more food reviews and awesomeness, including my first attempt at a sushi review. DOH!! I had Umami once in Santa Monica and it was delicious! I had no idea they even had one in Thousand Oaks but this sounds/looks terrible. Sorry you had a bad Umami experience, but glad you guys are back!! I guess I’ll just have to go try Umami Santa Monica until this baby Umami is all grown up.